I hereby present to you something interesting, simple and quite yummy. You can make it with two ingredients, but I made it with four and then went right ahead and made it into a meal. I was totally inspired by Joy of Oh Joy! who has a little cutie called Ruby, she has good taste has Ruby. I made a more grown-up and (very slightly, perhaps) less healthy option. Here’s my brunch for one. You could always make it a light breakfast and share between two (if you must). I got four small pancakes out of the following quantities. 1. Mash the banana into as fine a pulp as you can. If it is ripe enough, a fork is sufficient for this. 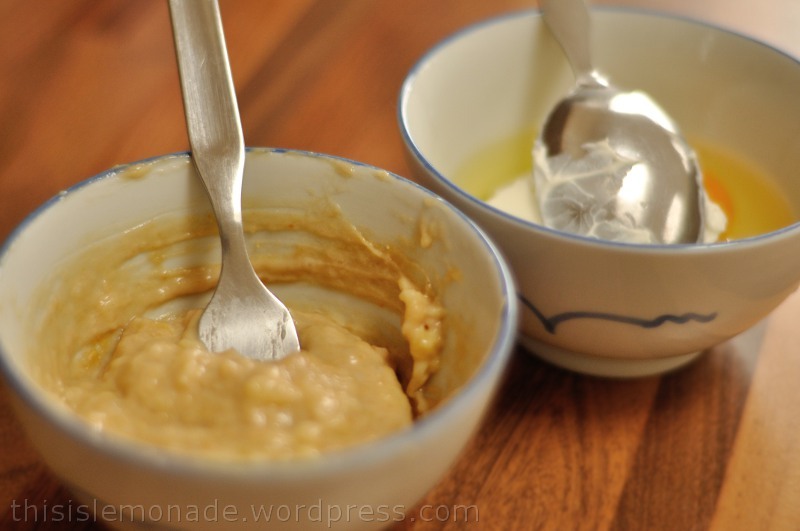 Mix in the peanut butter and then the yoghurt making sure the mixture is as smooth as you can get it. At this point, the mixture will be quite thick. 2. 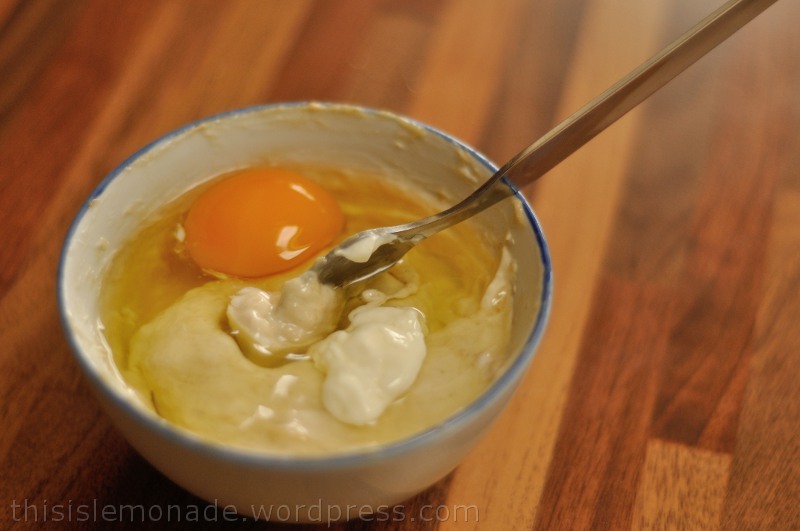 Mix in the egg. A small whisk may make it easier at this point, but I found it easy enough to fold in the egg carefully using the fork. Make sure you incorporate all the ingredients well. 3. 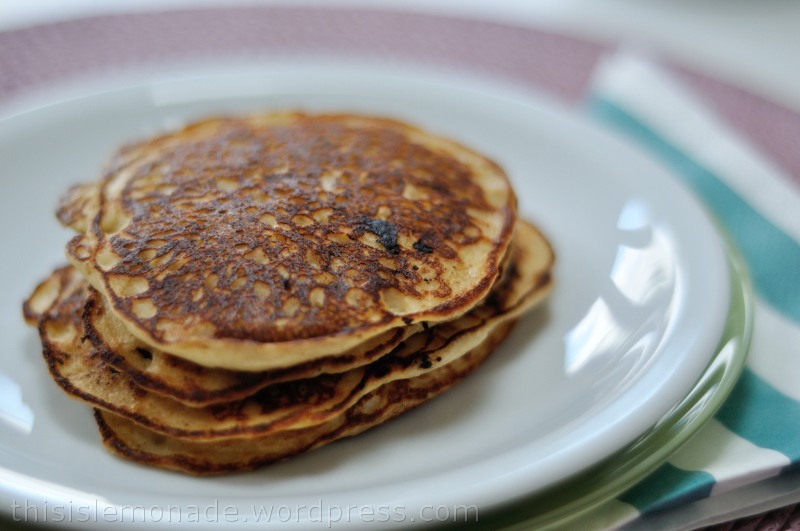 If you are just planning on making the pancakes, then go right ahead and skip this step. Otherwise, fry the bacon in a preheated frying pan. I like to use a non-stick pan so that I don’t have to add extra oil. When the bacon is crisped and brown, remove and leave to rest on some kitchen paper to soak off any excess fat. 4. Turn the heat down and spoon the pancake mixture into the bacon fat (or preheated oil) before turning the heat back up. Fry the mixture until you see little bubbles appearing all over the mixture and a faint browning at the edges. This will cook more slowly than standard pancakes and if you try to turn them too quickly, they will collapse so be warned! 5. Serve immediately. 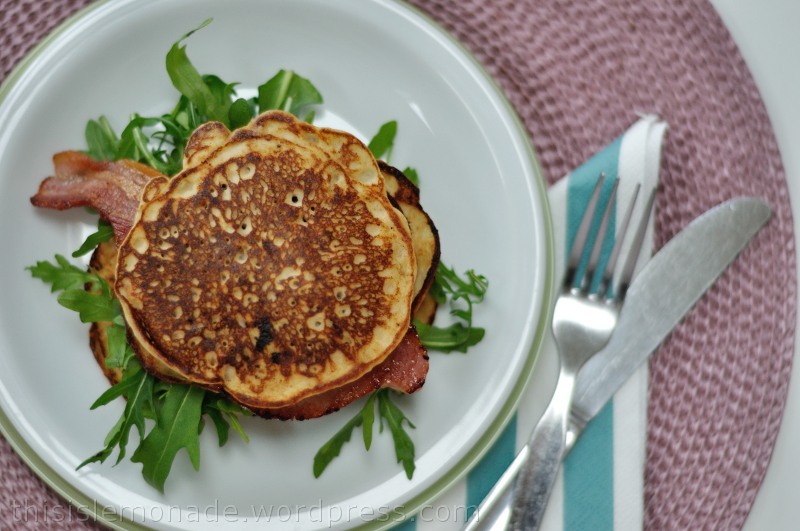 I sandwiched the bacon and some rocket between the pancakes. 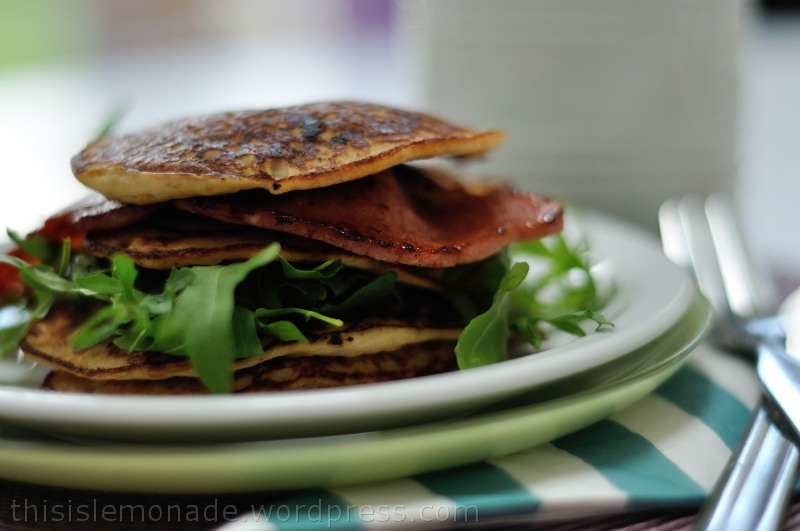 The flavours of the salty bacon and nutty rocket worked really well with the peanut buttery pancakes to make a very satisfying meal! 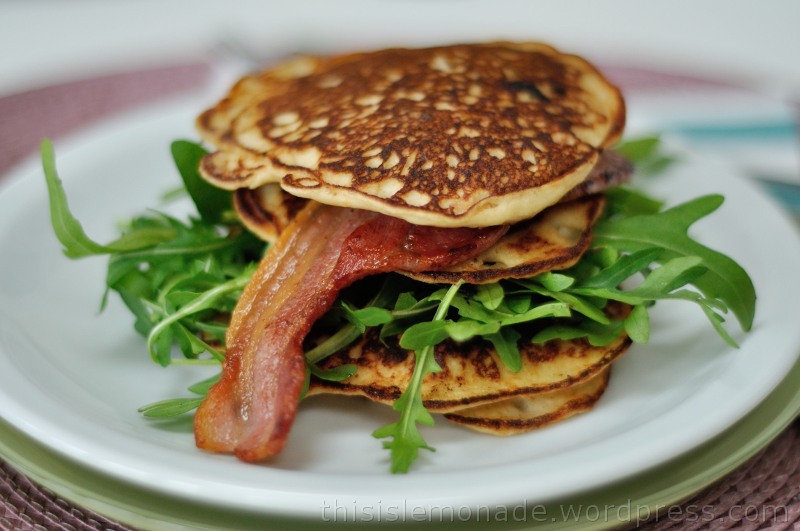 Categories: Food & Drink, Tasty Tuesdays | Tags: bacon, banana, breakfast, brunch, eggs, food, gluten free, lunch, Oh Joy!, pancake, peanut butter, photography, rocket | Permalink. Love the look of these – gonna try some soon! Oh I’m on for making pancakes this morning- I love bacon with it so why not just slip some between the cakes! What a great idea to add the mashed banana. Looks great! wow! you always come up with such creative meals! I would never have thought of that combination of flavours! When do I ever have time to actually stop what I am doing and make something that I fall in love with? NOW! I am standing up right now and making those pancakes! How easy is that recipe and I am craving it! Be back in a bit to let you know how much I love them! My niece and I loved them! thanks for sharing! Lovely recipe. I will have to try this. I am new to this blog and love it.